We are delighted to announce that The Hugh Davies Project, in collaboration with Access Space, has selected Anton Mobin from Paris as its instrument-builder in residence. Anton will be at Access Space and Re:Fab Space, Sheffield from 29 Feb-11 March 2016. RECYCLING: Please note that our computer recycling operation has changed. Due to the diminishing demand for desktop computers we now only recycle laptops which we use in our charitable activities. We have partnered with Range Rover Hire London Ltd to offer us a fleet of Range Rover Cars for our office user around London. These cars are perfect people carriers and have enough space to carry more than people in Luxury and this way you only need a van for big jobs around London. 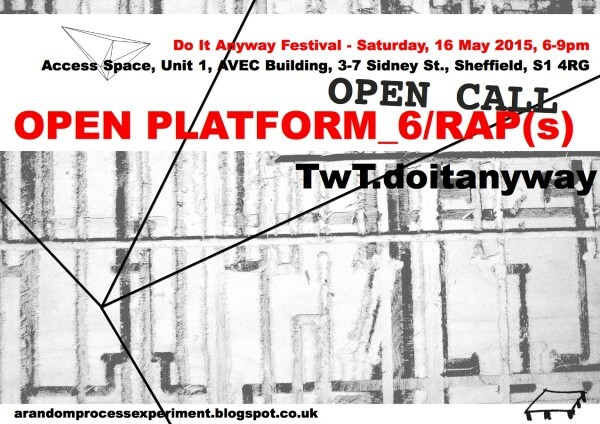 Do It Anyway is Access Space’s first festival as well as the first manifestation of a European Pixel Network festival in the UK. The weekend of 15/16/17 May will feature free performances and workshops from digital artists from Finland, Norway, Iceland, France and the UK. The final event will be an Algorave (just £5 entry) on Sunday 17th, 8pm-1.am. Venue booking – please download and print this form and contact us to discuss your requirements. Please note: As we have pressure on space we can only recycle laptops, mice and keyboards from now on. We no longer take in desktop computers, screens and printers – for this we recommend Aspire Community Enterprise. Artist & trader Kate Rich will deliver an experimental lecture on the darker macro arts of economics. Access Space is a registered charity based in Sheffield city centre. We offer a free, open access digital media lab which has been running for 14 years; a fabrication laboratory offering a HackSpace, laser-cutting tools and other digital manufacturing tools; computer recycling and building based on free and open source software; and an arts programme providing inspiring activities such as workshops using the latest creative software, exhibitions and installations, performance events and artist residencies. We have thousands of people participating every year, of all ages, from every part of the city, and beyond.